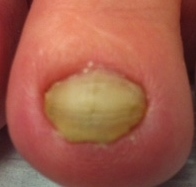 Toenail fungus, or Onychomycosis is one of the most common types of fungal infections. In fact, 25 million Americans suffer from this disease. Though this disease is not painful, it is certainly embarrassing and causes a fair amount of discomfort to those suffering from it. The most unfortunate thing about this infection is that it has a tendency to surface again and again. Moreover, it rarely responds to over the counter medications. Hence, people infected with toenail fungus are often frustrated and resort to newer ways of treating this disease. 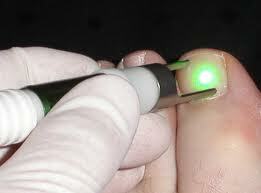 One such emerging treatment option for toenail fungus is laser therapy. NEW laser technology kills the pathogens that cause toenail fungus (Onychomycosis). Historically, Treatments for fungal nails included topical mediations, oral agents (pills) or surgical removal of the nail plate. The topical medications were largely ineffective. Oral agents have been known to affect the liver and blood tests needed to be monitored to prevent potential damage. Removal of the nail plate was painful and debilitating. Patients complain that toenail fungus is ugly and embarrassing. This condition is often ignored because the infection can be present for years without causing any pain. If ignored, the infections can spread to other toenails and even the fingernails. Severe cases can impair one’s ability to walk or lead to painful ingrown toenails. In addition, secondary bacterial infections may occur on or around the toenails plate. The laser destroys the fungus that lives in and under the toenail by generating a sufficient amount of heat. The laser light passes through the toenail without causing damage to the nail or the surrounding skin. At the time of the procedure, the toenail will not become instantly clear because it takes time to grow out. Just like the oral antifungal medications, response is measured in months as the nail grows out clear. Like all medical treatments, not every treatment is guaranteed. Response to laser treatment is 85% successful. You must have the toenail diagnosed prior to any fungal treatments. When the original lasers were developed within the last 5-7 years they were the size of Dishwashers, and are still being used today. They cost a lot of money to buy and the cost of treatment had to be higher in order to pay for them. With so much knowledge amassed and technology shared, lasers are being made into a smaller package. This newer cost effective technology allows us to provide newer and more cost effective treatments.